Let’s talk about Christmas party dressing. Tis the season where people all around the world are deliberating what to wear for the office Christmas party, festive family get-togethers on Christmas Eve and, of course the most glamorous occasion of all, New Year’s Eve. Christmas is the one time of year when all rules regarding being overdressed go out of the window, preferably with a blaze of tinsel and glitter following closely in their wake. You see, there is no such thing as a fabric too sparkly or a heel too high at this time of year. Upping the opulence comes with the territory at Christmas and - as is always the case when it comes to Christmas dinner too - ‘the more the merrier’ has never rung so true as it does when you’re talking about the diamantes and sequins on your Christmas party dress. Christmas party pieces come to embody the excitement of the season and while other ‘going-out’ items in your wardrobe have a tendency to quickly become wear-once wonders, there is something special about the pieces that have seen you celebrate with friends, raise champagne toasts with family and dance in a brand-new year that makes them firm favourites for years to come. With your cosy cardigans eschewed for the evening, high octane opulence is the order of the day, or rather, of the night. Which is where this sparkling style by Michael Kors comes into play. It’s the little black dress but not as you know it. The slinky sheath style is embellished to within an inch of its life, as all good party dresses should be, with crystals and pearls covering the entire bodice to create a look that will knock ‘em dead at the work do. Another style set to debut at our festive soirees is a new take on prim and proper from Moschino. 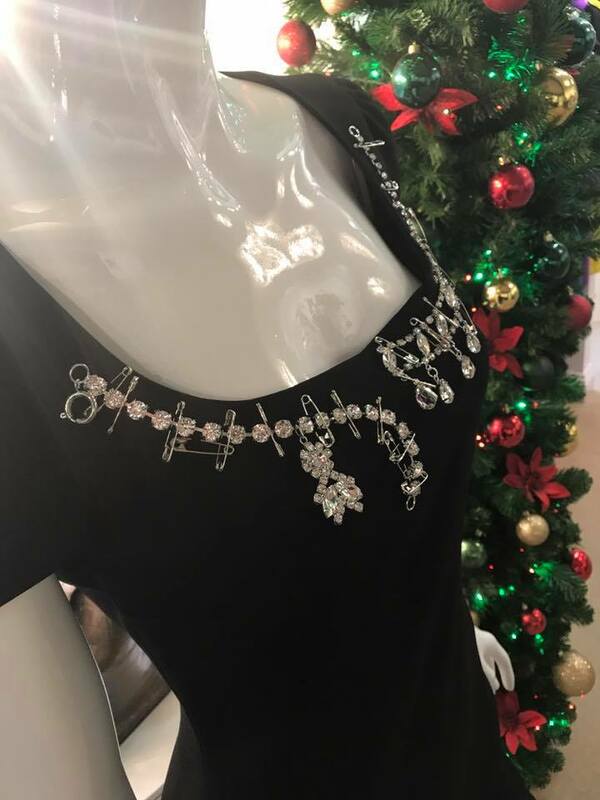 Diamantes on a dress are nothing new but the safety pins on this LBD give the impression of a Park Avenue Princess with extra attitude, pinning the family jewels to her favourite LBD for a festive night on the town. Tis the season to be stylish, so visit Robinsons today and let us dial up the glamour on your festive looks just in time for those Christmas parties. After all, you deserve a little festive treat too, right? If there is one thing guaranteed to get us through another grey British winter, it is the thought of the new season spring/summer trends which wait on the other side. With the international fashion weeks now at a close and the September issues dog-eared and put aside, we’re now in the know on next season’s top trends. There’ll be florals and pink, of course – groundbreaking, right? – but these are the true trends you’ll be seeing on the most fashionable city streets this summer. Looks emblazoned with logos were once considered the ultimate fashion faux-pas, but SS17 sees designers shouting their names from the rooftops. Jeremy Scott’s Moschino is the trendsetter here, his new season collection using trompe l’oiel to recreate everything from pearl necklaces to that now-iconic golden Moschino belt. This ultra-feminine trend is one to buy into now, with the shops packed with ruffled pieces that’ll see you through well into next summer. Soft ruffles rule and they’re set to be spotted here, there and everywhere, from shoulders to skirts. Thrilling frills are SS17’s most romantic trend, so veer towards soft shades and even softer fabrics. Gingham never really disappears from the fashion radar, returning with the sun every summer. Spring/summer 2017 puts the print to the fore, the outfits reminiscent of Hollywood’s jet-set holidaying in the exclusive resorts of the Amalfi Coast. Bardot tops will continue to prove the place of shoulders as the erogenous zone of choice and will be paired with Capri pants come summer. For those who never did love the ‘less is more’ approach, flamenco-inspired ruffles of gingham will fit the bill better. It’s been a case of less is more when it comes to jewellery, but bling is back for spring/summer 17. Pat Butcher eat your heart out, because this season’s bedazzlements are bigger, brighter and more blingy than they’ve been for years. Side partings and casual updos will be back in-vogue, their sole purpose being to ensure your statement earrings take centre stage. To tap into the trend, think circus-size hoops, hammered metal discs and diamantes befitting of the family heirlooms. If there is one trend you’ll see recreated from high-end to high-street for SS17, it is stripes. Whilst Breton stripes will never go out of fashion, this season’s stripes are bigger and bolder than ever. Mulberry led the way at London Fashion Week, sending out school uniform style stripes in white, burgundy and blue. Elsewhere, stripes were little and large, vertical and horizontal, but always bright. Where black stripes did appear, they were sandwiched between several primary shades. It is a trend which has long been loved by Coldplay frontman Chris Martin, but tie-dye certainly wasn’t a regular on the runways. Until now. Prepare to channel some serious Woodstock vibes in SS17, because tie-dye is back. The seventies have stuck around season after season, and their newest incarnation will see you make like Joni Mitchell, the hippie chick icon of the era. The key to bringing free-spirited tie-dye into the everyday is to pair it with more polished pieces, such as a leather pencil skirt or ankle tie heels. Shop new season styles first at Robinsons of Bawtry, the region's leading designer fashion boutique.